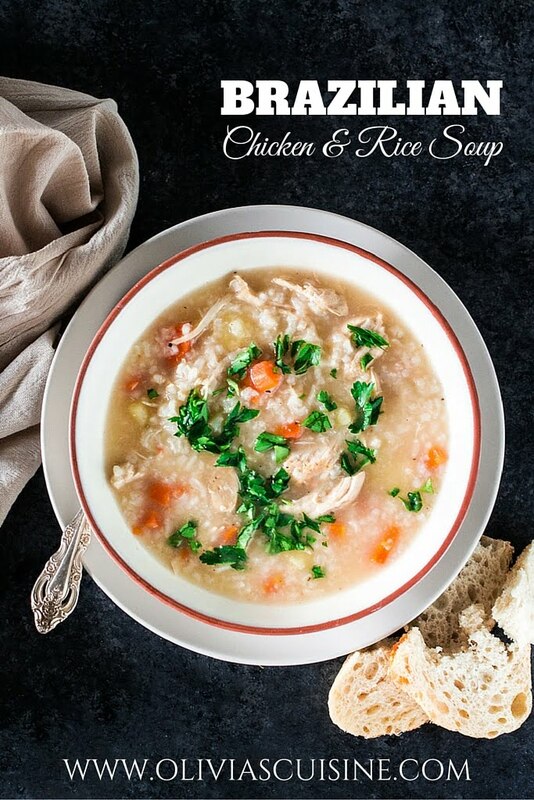 Just like my grandma makes it, this chicken and rice soup is simple yet very comforting! Make a huge pot so you can have something to warm you up all week. Snowzilla Jones is in NY and it’s making everything stop. The mayor declared a state of emergency, suspended all public transportation and imposed a travel ban, meaning if you’re out and about with your car after 2:30pm you will be arrested! Daaaaamn! What does all that mean for me? All Broadway shows were cancelled (shocking, I know. Mustn’t the show go on? ), so no work today. Me, Tim and Lola are snowed in and all that I foresee for my near future are blankets, hot chocolate, red wine, Netflix and a bowl of hot soup. Oh, I admit it: I love snow days! I have a pretty good variety of delicious soups up my sleeve and here on the blog. There’s the sweet potato soup which is always a hit with my sweet potato fanatic husband, the pumpkin soup that gets a little spicy kick from the curry, the Portuguese Caldo Verde that is very filling with the sausage, potatoes and collard greens, the German sausage and barley soup, the Vichyssoise and the Brazilian classic black bean soup. All very delicious and perfect for the cold weather! 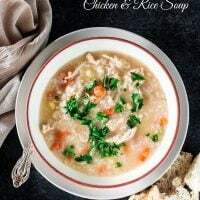 However, snow storm means a need for the ultimate comfort food, and for me that’s my grandma’s chicken and rice soup. 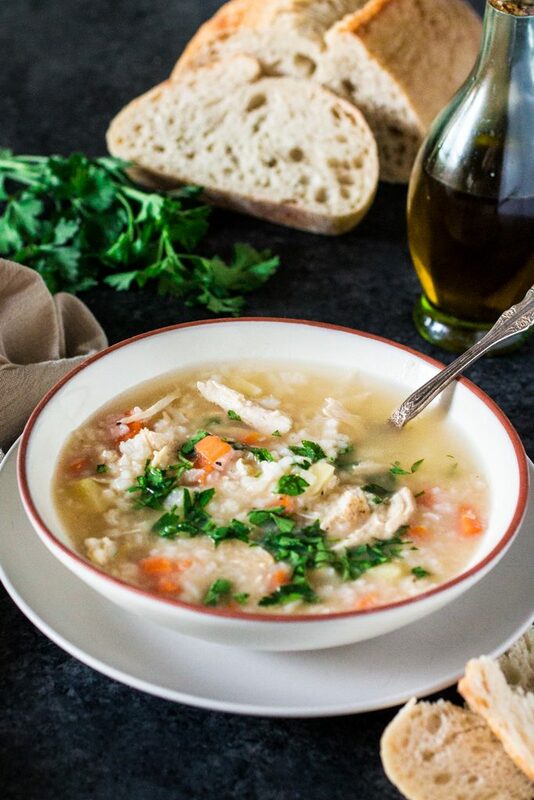 If winter is over and you haven’t made this soup, life is passing you by, my friends! Ever since I got the recipe with my grandma, I’ve made this soup quite a few times, thinking I could perfect it. Oh, how I was wrong! Usually, I like to tweak a recipe by changing a few things here and there to make it my own. So when my grandma said that I was supposed to add the rice, alredy cooked, at the end, I thought it would be more practical to add raw rice and cook it with the soup. The results? The rice soaked up all the liquid, got extremely soggy and the soup was a gunk. Exactly what she said would happen! Really, I should know better by now. Grandma’s always right! Moral of the story? Use cooked rice. And always, always, always listen to your grandmother! In a large pot or dutch oven, over medium heat, heat the olive oil and sauté the onions and garlic until softened, about 2 minutes. Add the chicken, the tomatoes, the celery sticks to the pot and cover with the water. Cover with a lid and cook until the chicken is cooked through and the tomatoes are almost falling apart, about 20 minutes. Remove the chicken and strain the broth,discarding all the veggies but saving the tomatoes. Return the broth to the pot and pass the tomatoes through the strainer, combining the resulting juices to the broth. Shred the chicken with the aid of a fork, getting rid of the skin and bones, and return it to the pot. Add the diced potatoes, the diced carrots and the chicken bouillon. Cover and cook for about 15 minutes or until the potatoes and carrots are soft. Then, add the rice and let it boil with the soup for 5 more minutes. Season with salt and pepper, sprinkle with chopped parsley and serve with bread, olive oil and parmesan cheese on the side! This soup can be frozen for up to 3 months. Just thaw it overnight in the fridge and reheat on the stove or microwave! Wonderful “canja” you made! For your very cold days in New Jersey, nothing more than perfect! My boyfriend and I really enjoyed this recipe! I suggest doing 3 potato’s and 1 carrot tho, also adding a little chicken broth or an extra cube on chicken brouillon. Really good instructions and it turned out super well. A new favourite for us.